A herbaceous perennial, the horseradish plant (Armoracia rusticana), is grown only as an annual in temperate climates. The plant grows in a rosette form up to 3 feet in height. It can actively produce harvestable roots for up to 20 years in ideal growing conditions. Once established, it is extremely invasive and difficult to entirely remove, according to Virginia Tech. Besides its use as a culinary additive, horseradish root can also repel soft-bodied insect pests, aphids, whiteflies, blister beetles, Colorado beetles and numerous caterpillars when properly prepared. The roots of the horseradish plant contain the enzyme myrosinase and iso-thiocyanate compounds which are sulfuric. When the root is harvested and chopped, the chemicals become volatile from air exposure. The pungent aroma causes the eyes and sinuses of mammals to water excessively from irritation. When preparing horseradish roots for culinary uses, vinegar is added to control the iso-thiocyanates which limits the heat that the root produces. The Society Promoting Environmental Conservation in British Columbia advises boiling 1 inch of horseradish root that is finely chopped with 3 quarts of water mixed with 2 cups of cayenne pepper and 2 cups of geranium plant roots. The mixture can be strained and then sprayed onto garden plants using a handheld garden sprayer to help repel pests. Planting horseradish plants besides potatoes helps to repel potato bugs. They are also useful in repelling blister beetles from the crop. Plant horseradish in containers to keep the plant from spreading and becoming established. Place the horseradish in the corners of the potato patch for best results, according to the Michigan State University. Harvesting of horseradish root can begin when the plant's top dies back. The roots should be lifted when the ground is still soft enough to successfully dig. The dried, dead foliage can be mowed down to reach the roots easier. In a small garden roots can be dug up any time of year as long as only a few small roots are harvested to use as an insect repellent. 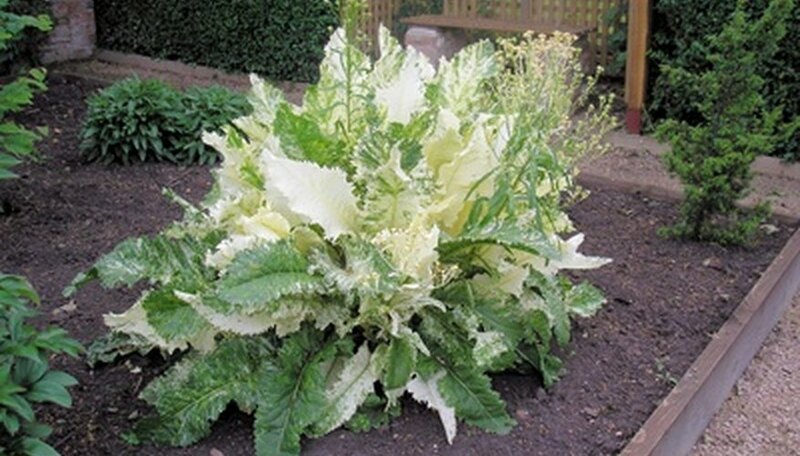 Apply insecticides containing horseradish in the early morning hours when the plants' foliage is still cool so the liquid solution does not burn the leaves. Always spray only a small area of the plant and than wait at least 24 hours to make sure that there is no adverse reaction to the preparation. Always wear gloves when applying to limit skin exposure and avoid possible irritation from occurring.